Yes, we got some more animals. 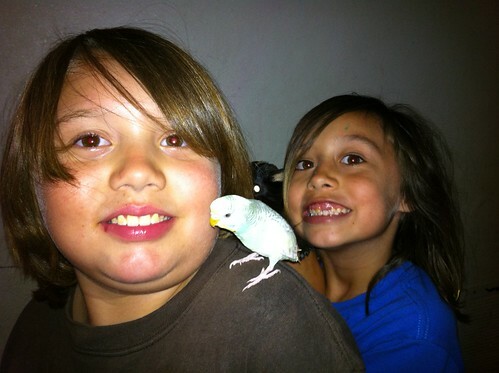 We now also have a guinea pig and a bird. The kids are very excited and love them already. 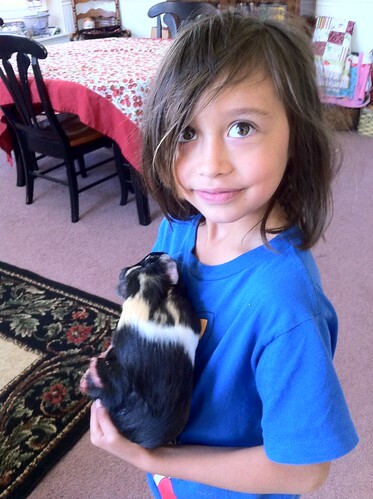 Maggie holds the guinea pig like a baby. Joaquin and the bird have become fast friends. The bird sits on his shoulder and also, now on his finger no pecking! He is very excited. Joaquin has Autism as I have mentioned before. When he has something of a living, breathing companion he feels secure. I have always found it interesting that he loves birds. They have flight and in some ways that seems gravity defying. Joaquin has sensations quite often that he is losing his gravitational pull. He was get visibly and vocally upset. He needs rocks in his pocket and....someone to hold is soft pudgy hands. Maggie probably has ADHD, and maybe be Bi-Polar. This is what has been suggested but, without proper diagnosis. Either way, like Joaquin we still love her. Animals calm her down so much. She has her lab/pit mix lay down with her and he spoons her face to face. She will close her eyes and strokes his coat and everything is good. Small animals give her something beyond herself to care for and nurture. She loves this. These a few of the reasons I don't mind having various animals around.